Can there be anything more adorable than a 2 year old in a hoodie? I think not. But seriously, I absolutely love this pattern and I cannot wait to make many more of them! My only sadness is that I don’t know how to use my serger yet (beginning Craftsy serger class next week!) because that would make this hoodie ridiculously fast to put together. As it is, it’s still a fairly quick and easy pattern. I used my walking foot and a jersey needle for the entire thing and didn’t have any problems with the construction. The main fabric is a clearance jersey blend knit ($3/yard!!) from Girl Charlee. It isn’t a 4 way stretch like the pattern recommends and as a result, it’s a bit snug on him even though I sized up to the 3T but I kinda like that it shows off a bit of the toddler belly. He loves it and didn’t take it off all afternoon so it’s a win all around. If I use another similar knit, I will size up to the 4T so he will get more wear out of it. To make this even more perfect, we got snow this afternoon! Y’all it rarely snows here so this is a special occurance. 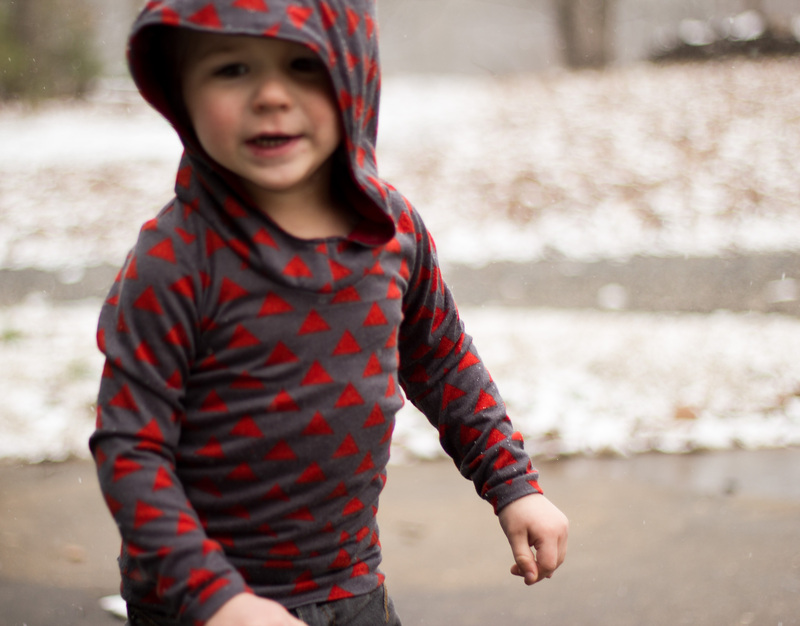 My hubby took O outside to play in the snow, and I coerced him to snap a few pictures of O in his Bimaa before we put his jacket on. Poor little fellow lasted about 2 minutes before he was begging for gloves so I don’t have a good full body shot but thankfully the husband is a master photographer and managed to take these adorable (IMO) pictures in that short period of time. This entry was posted in Clothes, Kid sewing and tagged bimaa, bimaa sweater, handmade hoodie, kids clothes week by oliver's fancy. Bookmark the permalink. So cute! I love the toddler belly too. The hoodie is very cute, good luck learning your serger. Thanks! I have a feeling I’m going to need the luck! Thanks! I think I’m hooked on bimaas now! Toddler belly is always a good thing! Love your Bimaa! I love both your boy bimaas, they are so cute! thanks for the inspiration! Might need to get some of that triangle knit. Also- you will love your serger. It’s the only thing I use on tops like this anymore! Thanks! I had to go get more triangle knit after KCW was over bc I was loving it so much. 🙂 you won’t regret getting some for yourself! And I’m happy to say I’m getting used to the serger and can’t wait to try it out on some clothing- will make it so much faster.